Breeding of Citrullus spp. for various benefits has continuously raised interest particularly for economically important crops. However, the interspecific variations within the genus have remained obscure in many regards and the multitude of names for taxa and subtaxa eludes Citrullus breeders. In the absence of clear taxonomic differentiation, molecular analysis of phenotypes did not help understand the complexity of this genus until recently. 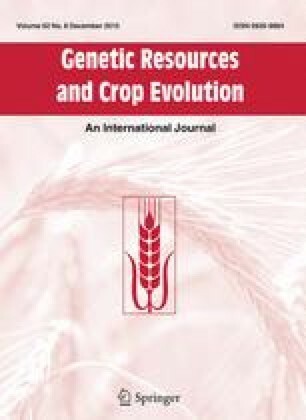 In this study we carried out a phenetic characterization of a world collection of 213 accessions using 22 agro-morphological descriptors in field trials conducted in two locations and during two consecutive years. Multivariate analyses confirmed high morphological variation in Citrullus spp. and highlight C. mucosospermus as a homogenous group separated from other Citrullus species. This differentiation of egusi-type melon will help leverage breeding and conservation purposes as C. lanatus represent very important economic crops in the world. Based on our findings we conclude that our knowledge of the relationships between genetic variations and phenotypic traits and the determinism of morphological variations among and within Citrullus need to be further deepened. The online version of this article (doi: 10.1007/s10722-015-0220-z) contains supplementary material, which is available to authorized users. This study was financially supported by the International Foundation for Science (IFS) under research Grant C/3709-2, the Vavilov–Frankel Fellowship under Grant CONT/08/136/RF, and the National Agricultural Research Institute of Benin (INRAB). We thank the United States Department of Agriculture (USDA) and the Leibniz Institute of Plant Genetics and Crop Plant Research (IPK) for providing accessions for this study. We acknowledge contribution and technical support from Alphonse Kouke and Christina Koch.